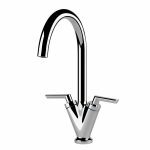 The San Marco Davenport Kitchen Mixer Tap is one of my favourite Kitchen Mixer taps and I think that the reason I like it so much is because its understated in a very simple, chic way by the levers being slimmer than the body of the tap and not tapering in at the top. There are so many 2 levered swan neck taps to choose from and sometimes the differences between them can be very obvious e.g. chunky handles or a flatter spout, but sometimes the differences can be very subtle. 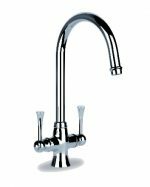 The San Marco Davenport Kitchen Mixer Taps is a slimmer sister of the Savona Kitchen Mixer Tap by Carron Phoenix! In which case your choice between the two might be decided by your budget as much as your taste ! 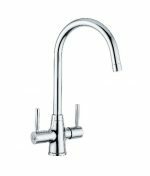 Retails at the price you see including VAT in chrome finish which is excellent value for this Italian Manufactured Kitchen Mixer Taps. 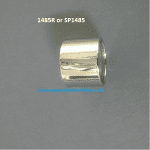 As a rule of thumb other non chrome finishes are generally more expensive but I think it is worth paying that bit more if you get the colour finish that matches with your kitchen (see below on Colour / Finish regarding matching the tap to the colour finish of your sink). 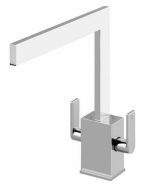 You can’t get easier than levers to turn on or off but if you require even more ease, then there is the San Marco Riviera Palazzo or San Marco Riviera Lever Handles where the levers are angled to make it even easier. 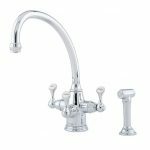 If you want a brushed nickel finish and want to stay within the same price range, there is the very keenly priced San Marco Langley Value Kitchen Tap. Tip: If you choose ‘Pewter – Brushed Steel/Nickel’ in the ‘Choose Color/Finish’ widget on our shop pages sidebar, it will give you all the products available in that finish. One other important issue to remember when buying a tap is that if the tap is being directly fitted into your sink (instead of being mounted in the worktop behind the sink ) then sometimes the finish of the sink will dictate the colour finish of the tap e.g. 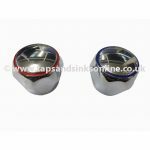 a chrome tap looks nicer set into a highly polished stainless steel sink whereas a brushed nickel tap looks nicer when set into a matt finished stainless steel sink. If you are unsure of matching finishes as pictures can be deceptive at times, just contact us and we will guide you. Style of Handles / Spout – Levers! For a contemporary take on this style – take a look at the fabulous San Marco Blade Kitchen Designer Tap! 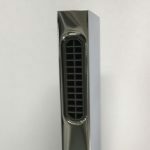 Want to select color / finish of your Davenport tap now? Simply click on the button below! We are always available to assist you with any queries that you might have. Just contact us at sales@tapsandsinksonline.co.uk and we will be more than happy to help.